North Dean near Bowness-on-Windermere, Cumbria sleeps 10 people. 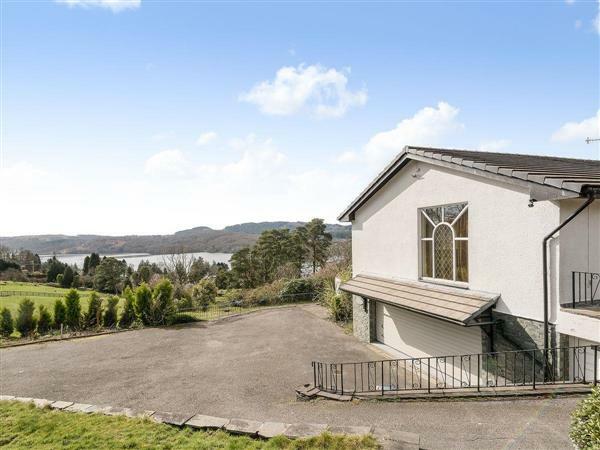 North Dean near Bowness-on-Windermere is a distinctive, detached luxury property, which is the perfect venue for a special family get together, and is certain to offer guests a stay to remember. Sitting in an elevated spot in an exclusive residential area, North Dean commands fabulous lake views from most main living areas, as well as from some bedrooms. Picture windows take full advantage of these, and the extensive terrace areas and south-facing viewing balcony off the living room offer the opportunity to enjoy every aspect of this incredible view. North Dean also has its own heated indoor swimming pool with changing facilities and a poolside seating area, as well as a hot tub which is housed near the covered outdoor seating area. Whatever the weather, guests will be able to take full advantage of the facilities on offer. For additional entertainment, the games room has a slate bed pool table and table football. The well-proportioned and elegant accommodation includes a spacious living room, the perfect space for family gatherings to share special times; the large dining table is positioned by the full-height picture window so that you can admire the spectacular views across the lake towards Ambleside whilst eating. Bedrooms are beautifully appointed, and the master bedroom enjoys spectacular lake views. Attached to the owners’ holiday annexe which they occasionally use, North Dean lies just a short drive away from the much-loved lakeside village of Bowness-on-Windermere. Bowness offers a tempting mix of shops, cafés and restaurants, and is home to the popular World of Beatrix Potter Attraction which celebrates the work of this popular children’s writer. Steamers will take you along the lake while the car ferry crosses over to the western areas of Coniston and Grizedale. The shop is 2½ miles, with the pub and restaurant 1 mile from North Dean near Bowness-on-Windermere. North Dean near Bowness-on-Windermere has 2 steps to entrance. Games room: With table football and pool table. Bedroom 2: With zip and link twin beds (can be super king-size bed on request) and en-suite with shower over bath, toilet and bidet. Bedroom 3: With bunk bed and door leading to swimming pool. Living room: With wood burner, 60 Smart TV, Bose music system, Xbox 360 and patio doors leading to balcony. Kitchen: With breakfast area, double electric oven, gas hob, microwave, 2 fridges, freezer and dishwasher. Bedroom 4: With kingsize bed, dressing room and en-suite with freestanding bath, shower cubicle, toilet, bidet and heated towel rail. Gas central heating (underfloor in kitchen and swimming pool area), gas, electricity, bed linen, towels and Wi-Fi included. Logs for wood burner available locally. Travel cot and highchair. Welcome pack. Landscaped lawned garden with seating areas, patio and garden furniture. Balcony. Indoor heated swimming pool (private, 8m x 4.8m, depth 1.1m - 1.8m) with shower facilities. Hot tub for 6 (private). Private parking for 5 cars. No smoking. Please note: Bedroom 3 and 5 have shared use of the en-suite facilities. Access to the lower garden level is via 6 steps. Holidays at North Dean run from Friday to Friday. For a better idea of where North Dean is, you can see North Dean on the map below. North Dean is in Cumbria; should you be on the lookout for a special offer, you can find all the special offers in Cumbria. It's always worth checking to see what is on offer at the moment. Do you want to holiday near North Dean (UKC1472), you can see other cottages within 25 miles of North Dean; have a look to find your perfect holiday location.